Home Healthcare and health reform child health The most comprehensive wrap on the national obesity inquiry that you will read today! The most comprehensive wrap on the national obesity inquiry that you will read today! 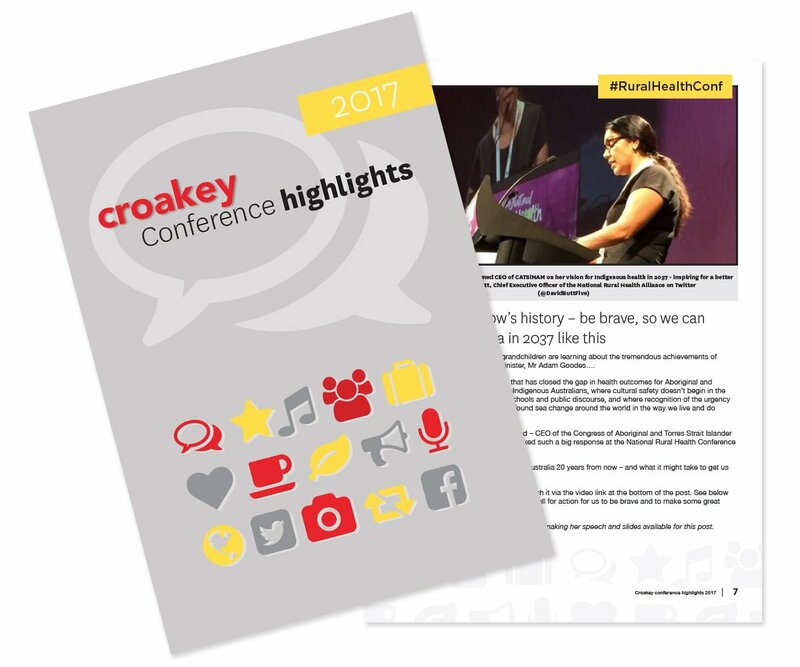 The number of submissions to a Senate inquiry into the obesity epidemic in Australia has jumped to 120 since Amy Coopes reported for Croakey last week that there had been “a meagre” eight submissions. 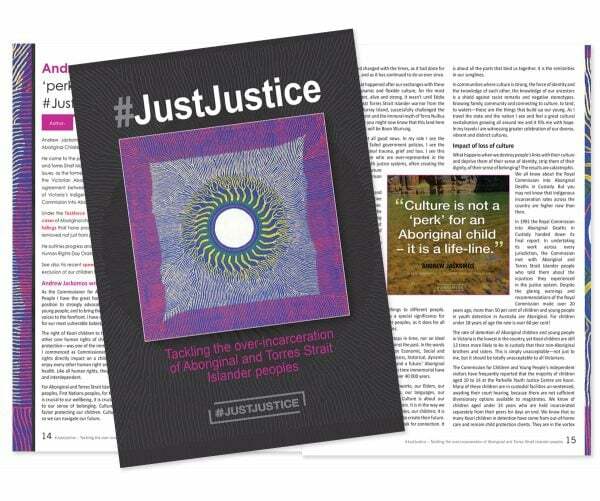 In the #LongRead below, Melissa Sweet gives an overview of the submissions to date, taking readers on a global tour that begins in western Sydney and the Illawarra in NSW, and also surveys the empty heart of national policy making in Australia. One clear message is that addressing obesity requires a systemic focus on reducing social and economic disadvantage, as well as wide-ranging regulatory and other policy responses. 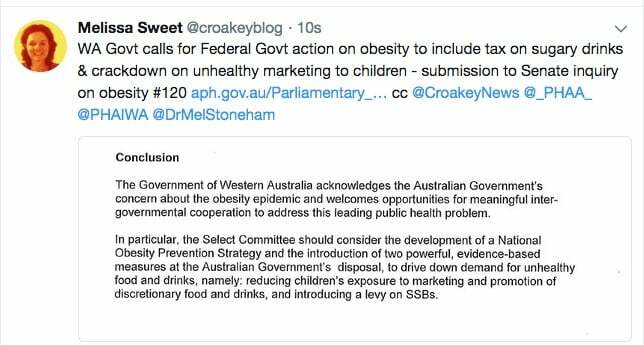 As one poignant submission from western Sydney argues, every level of government is failing those children who are developing serious and often life-long health problems as a result of obesity. (The Senate committee is still accepting submissions and more will continue to be published at the inquiry website, according to advice received by Croakey today). Among the 120 submissions published to date by a Senate inquiry into the obesity epidemic in Australia, Submission 18 is one not to miss. Signed by 18 staff members of the Nepean Blue Mountains Family Obesity Service – including endocrinologists, a nurse/diabetes educator, midwives, dietitians, clinical psychologists, physiotherapists and administrative staff – it makes a compelling case for addressing social and economic disadvantage as underlying contributors to obesity. The service is located at Nepean Hospital in Sydney’s west, and its patient group are “children with extreme obesity and poor health, such as early diagnosis of type 2 diabetes mellitus, non-alcoholic fatty liver disease, joint and mobility problems, sleep disturbances, psychological distress and social isolation, projected to have premature mortality”. 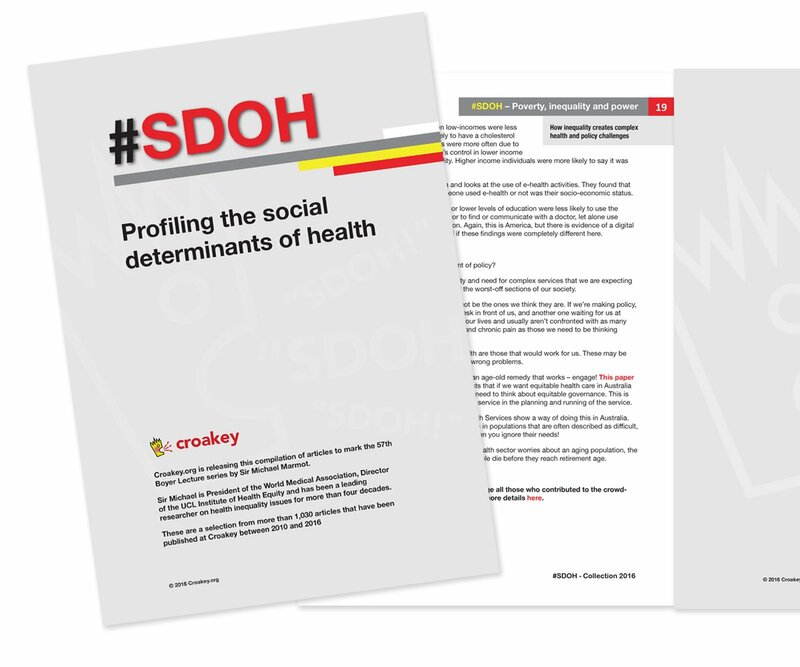 The suburbs of Penrith and Lithgow, which are within the Nepean Blue Mountains Local Health District and Local Government Area, are among the most disadvantaged areas in NSW. The region has one of the country’s highest levels of childhood overweight and obesity, with 24.8 percent of secondary school students in Western Sydney and Nepean Blue Mountains Local Health Districts being overweight and obese in 2014, compared with the NSW rate of 20.6 percent. Our team deals with the sad reality of extreme obesity daily. The typical paediatric patient engaging with our tertiary service tends to live a stressful life. One or both parents of this child are obese, often living on minimal incomes, and have high stress and/or medical co-morbidities. Children suffer psychological illness due to bullying and weight stigma and feel excluded from school and peer interactions. The authors stress that obesity is “NOT a personal choice”, instead describing how social and severe economic disadvantage contribute to an obesogenic environment producing higher rates of overweight and obesity, with implications for health and the local economy. 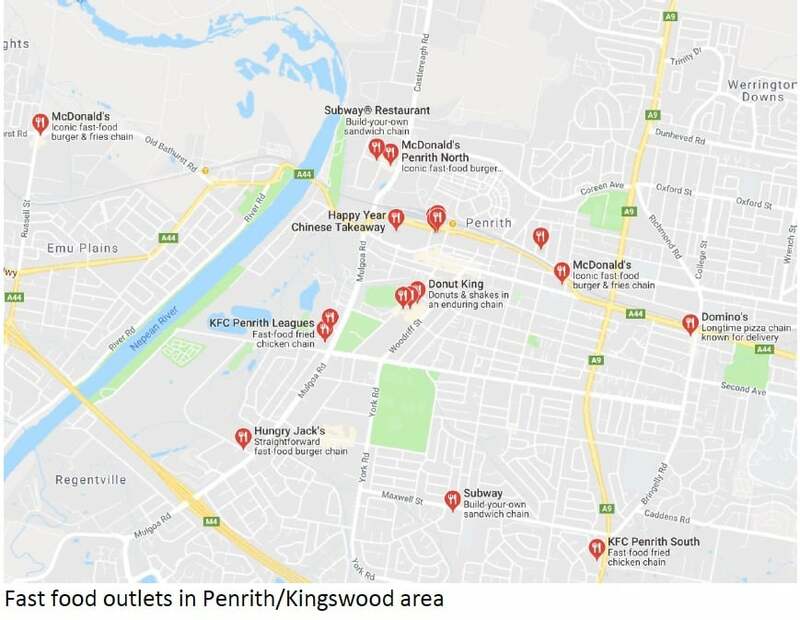 The submission says: “The density of take-away food outlets in one small strip of Penrith is jaw dropping to any outsider, although clearly quite normal to any long-term resident of Penrith (see the submission’s map below). But even within the region, there are significant differences – a reminder of the importance of understanding diversity within local communities. The submission cites the Blue Mountains community as an exception to the rule, for having “bucked the regional trend for fast food”. How can they when they are fighting against the normalisation of energy dense foods and beverages within society and the environmental and economic disparities that exist across Australia? Laws and legislation at each level of government, community-based interventions and health promotion in the NBM area have failed these children. The submission states that Western Sydney is Australia’s third largest economy, and that people in the West “should enjoy the privileges afforded to those in city areas, including living environments conducive to health and wellbeing”. The submission calls for laws, regulations and taxes to reduce the availability and normalisation of energy dense foods and beverages, regulate the number of fast food and takeaway venues serving nutritionally poor food, and to increase the number of venues serving healthier options. It urges strategies for energy dense foods and beverages akin to those used in highly effective anti-smoking campaigns. This would include government advertising strategies to generate stigma around sugar sweetened beverages and ‘junk’ food. The submission also calls for development in Western Sydney that promotes stronger communities, including access to fast public transport, and cites the example provided by the Victorian Planning Authority for two suburbs in Western Melbourne that includes plans for large open spaces, and well-designed bicycle networks. The submission makes many other recommendations, including workplace agreements that promote flexible working arrangements, especially for parents, allowing shorter commute times and more time to shop and prepare meals at home and provide time for family-orientated physical activity. Another group that is also calling for a health in all policies (HiAP) approach to address the wider determinants of health is Food Fairness Illawarra, a community-based alliance of over 400 community members, community groups, non-government and government organisations who have been working together for over 12 years in NSW’s Illawarra/Shoalhaven region. Their submission also highlights the association of obesity with social and economic disadvantage, and calls for action on the non-health factors that impact health and weight, including macro level social and economic policies that impact on social determinants such as early life, poverty, lack of education, food security, housing, social isolation/support and employment. Many of the key factors that impact on physical activity, diet and weight can only be influenced indirectly by the health sector, through partnerships with other sectors, including education, transport, planning, sport and recreation, their submission states. Communities also need to be supported and engaged to take action and address the local factors that impact on overweight and obesity. 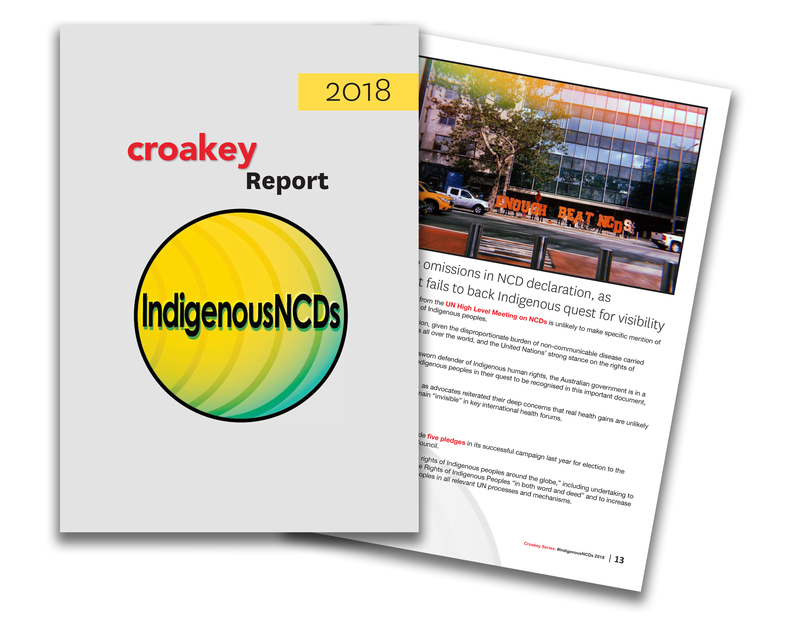 In addition to whole of population approaches, the group says priority should be given to interventions for Aboriginal and Torres Strait Islander people, people living in low socioeconomic circumstances, rural and remote areas, and those with established risk for weight-related chronic conditions. The Royal Australian and New Zealand College of Psychiatrists submission also recommends that people with mental illness should be a priority group. Submission 52, from academics from several universities who research food, eating and obesity, also stresses the importance of addressing the social determinants of obesity and taking a strong equity, social justice, and gender focus. They say food insecurity is an important cause of obesity among children, with those living in households lacking access to affordable food consuming higher levels of energy, fat and sugar and fewer vegetables. 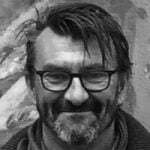 These researchers say that “simplistic” interventions encouraging people to change their behaviours, to eat a healthier diet or be active, focus attention on individual responsibility and choice, and do not address wider social determinants of health or the political economies of food. 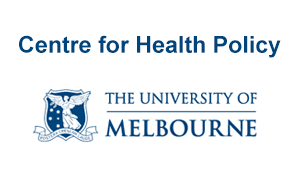 The Australian Prevention Partnership Centre (whose continued funding was announced just this week) cited its investigations into the price and affordability of healthy and current (less healthy) diets in Australia, and noted that a healthy diet is already unaffordable for low-income families, costing up to 31 percent of their disposable income. A working group of the International Health Economics Association’s Economics of Obesity Special Interest Group also highlighted the association of social and economic disadvantage with childhood obesity and the “intergenerational persistence of obesity”. The Australian Institute of Health and Welfare submission also highlighted the unequal distribution of overweight and obesity, with 35 percent of children living in the most disadvantaged areas being overweight or obese, compared with 23 percent of those from the most advantaged areas. Rates of 36 percent were recorded for the most remote regions, versus 25 percent in the major cities. The notion that cross-sectoral, HiAP and place-based approaches are needed to tackle obesity is, of course, not novel. It is surprising therefore to see how few submissions came from non-health sectors that might be expected to play a prominent role, such as local government, or departments of planning, education and community services. However, there were a few notable exceptions – such as the City of Greater Bendigo urging the Federal Government to reinstate the Healthy Together National Partnership and to tax high sugar beverages. 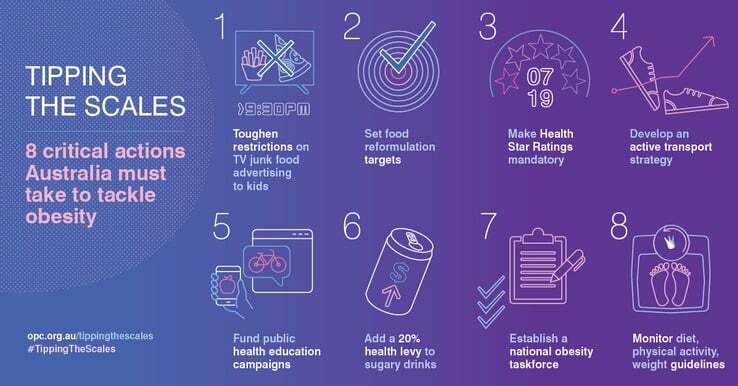 Several submissions suggest that Australia has gone from being a leader in tackling obesity to dragging the chain, particularly since the abolition of the National Partnership Agreement on Preventive Health and the Preventive Health Agency (both cut in the Abbott Government’s 2014-15 budget). Professor Steve Allender, submitting on behalf of the Global Obesity Centre (GLOBE) World Health Organization Collaborating Centre for Obesity Prevention at Deakin University, said improving the healthiness of food environments requires a comprehensive societal response, including government policies and wide-scale action from the food industry. 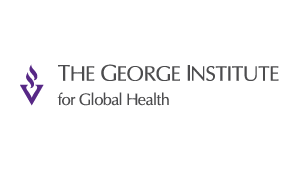 “Our recent comprehensive assessment of the policies of Australian Federal and State governments with respect to obesity prevention show that Australia is lagging behind other countries, such as the UK, France, Ireland, Canada and many Latin American countries, with no comprehensive national obesity or nutrition plan, despite being a key recommendation of the National Preventive Health Taskforce more than a decade ago,” he said. Current government policy relied heavily on voluntary company actions through flagship initiatives such as the Health Star Rating (HSR) food labelling scheme and the Healthy Food Partnership, a collaboration between government, food companies, and community groups, with the current focus mainly on product reformulation. Despite some positive steps by some food and beverage manufacturers and retailers, Allender said recent assessments of company nutrition-related policy and commitments found they are frequently non-specific and limited in scope. The overall response from the food industry to date has been weak and insufficient, he said. At the 2016 World Health Assembly, Australia had supported the World Health Organization’s report, Ending Childhood Obesity (ECHO), which reinforced the need for a comprehensive approach to preventing obesity (including restrictions on junk food marketing to children and taxes on sugar sweetened beverages) – but Allender said Australian governments were yet to act on it. • Chile passed a law in 2012 (enacted in 2016) with a three-pronged approach: ‘blacklabels’ (octagon shape) on foods considered to be too high in energy, fat, sugar and salt; these foods cannot be advertised to children under 14 years; and, they cannot be sold in or near schools. The advertising bans mean that cartoon characters have been removed from cereal boxes, unhealthy products cannot be sold via broadcast media between 6am and 10pm, and infant formula can no longer be marketed in order to encourage breastfeeding. 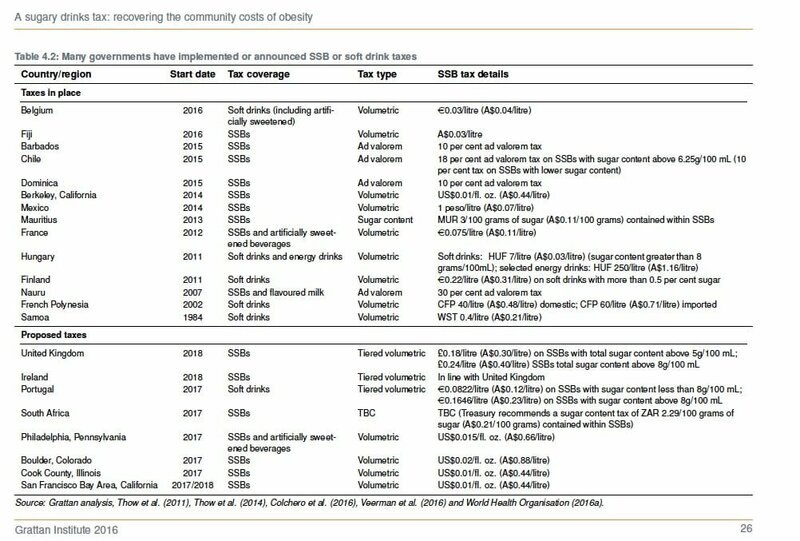 Chile also has an 18 percent soda tax. • England has a sugar reduction program that is a voluntary dialogue between Public Health England and the food industry, with a target of 20 percent less sugar across 10 product areas by 2020. It is aimed at all aspects of the food supply (retailers, manufacturers, restaurants, cafes, takeaways, pubs, entertainment chains and delivery services). • The USA has nutrition labelling for ‘added sugar’ and ‘trans-fat’ mandated for most packaged food on their updated Nutrition Facts label, from July 2018. Of note is the US Food & Drug Association definition of ‘added sugars’, which is similar to how the WHO defines ‘free sugars’. • The United Kingdom, Republic of Ireland, Mexico, France, and other countries have a sugar sweetened beverage tax. Evidence from Mexico has shown a drop in consumption of these drinks, especially among lower income families. • Canada is currently developing regulations to restrict marketing to children. The Committee of Presidents of Medical Colleges (CPMC) submission also identified several examples of other countries where governments have “intervened for the greater population health”. 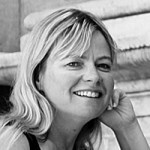 Jennifer Thompson, a research manager who made a submission in a personal capacity as someone with experience of being overweight, cited work being done in New Zealand with a Childhood Obesity Plan and by Canada, with Curbing Childhood Obesity: A Federal, Provincial and Territorial Framework for Action to Promote Healthy Weights. The food industry in Australia is a strong market force with significant lobbying strength in Canberra. Submissions also highlight disparities between jurisdictions. The South Australian Nutrition Network (submission 98) praised progress made by the NSW Government, and said the majority of obesity prevention activities in SA were de-funded in 2013. “In SA there are no current policy documents to direct, guide and support action to prevent obesity, particularly in children,” the Network said. Many submissions stressed the importance of acting at multiple levels in multiple settings, with the CPMC arguing for action to “traverse the breadth of social, environmental, regulatory and medical interventions”. Submitters supporting these recommendations included: The Centre for Adolescent Health, which is part of the Royal Children’s Hospital, the University of Melbourne and the Murdoch Children’s Research Institute; the Southern Grampians Glenelg Primary Care Partnership; Parents Voice; SugarByHalf; WA Cancer Prevention Research Unit at Curtin University; Sugar-Free Smiles; Queensland Country Women’s Association Country Kitchens (which works to improve food literacy through cooking lessons); the Charles Perkins Centre’s Food Governance Node at the University of Sydney, the George Institute for Global Health; the Public Health Association of Australia; NCDFree; CHOICE; and individual clinicians/practitioners. A focus on the first 1,000 days, from pre-conception onwards, was another recurring theme in many submissions, including by the Early Life Nutrition Coalition, established last year as a sub-committee of the Perinatal Society of Australia and New Zealand. The Early Life Nutrition Coalition recommended several changes to the Medicare schedule to facilitate access to accredited practising dietitians and nutrition advice during pregnancy and for women who are planning on becoming pregnant, to support allied health professionals to engage in childcare settings, and to equip GPs and expectant parents with advice relating to nutrition prior to conception, during pregnancy and in the first few years of children’s life. The Coalition also called for improved access to gestational diabetes mellitus education and support services, noting that women with this condition do not qualify for any Medicare rebate for services such as access to diabetes education, dietitian or other allied health services. More broadly, many submissions noted the lack of health services to support people and families in preventing or managing obesity and related conditions. The Australian Prevention Partnership Centre said there is no national universal public health service for families of children who are already overweight or obese, despite well-established evidence about the effectiveness of these services. The Centre cited evidence that childhood overweight and obesity management programs will only succeed long term if they are embedded into the health care system. 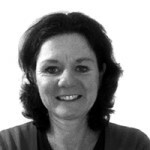 The absence of services is remarkable given the sheer numbers involved, with Professor Louise Baur and colleagues stating that more than a million Australian children are an unhealthy weight, putting them at much greater chance of becoming obese adults with increased risks of developing chronic diseases such as Type 2 diabetes, heart disease and cancer. 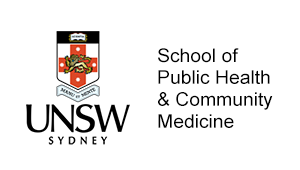 It is also notable that the Nepean Blue Mountains Family Obesity Service, which describes itself as “Australia’s first public, whole of lifespan, multidisciplinary, tertiary obesity service”, was established only in late 2016. Some submissions profiled good news stories. Allender cited a recent trial in ACT high schools showing significant reductions in overweight and obesity prevalence relative to controls over the two-year intervention period, alongside significant reductions in pre-clinical depression. The ACT Government has since translated this approach to a policy position for all ACT Schools. The Southern Grampians Glenelg Primary Care Partnership reported on “exciting early positive results” from its work over the past three and a half years to improve the health and wellbeing of the community within south west Victoria (as I also profiled for Inside Story in this article last year). The Parnership reported that the wide-ranging changes made across many different parts of the community are having “an impact on the choices our children are making and their health”. The Partnership called for governments to invest in community building and development with a focus on obesity prevention, stating that while their work is still in its early stages, “it is showing promising results and we believe the key to the success is in mobilising a local place based community to take action on the parts of the obesity system it has influence and control over”. But local work can only achieve so much in the absence of national leadership. YMCA Victoria, for example, described the work of its 19 member associations supporting over 741 communities across every State and Territory, with 30 million participations in its programs and services across the country. While the organisation had made changes to the foods and drinks sold in its 65-plus YMCA-managed community recreation and aquatic centres, and was doing what it can, “this is not enough”. In a similar vein, the Western Australian Government submitted that while States and Territories can do much to promote healthier environments, some of the most powerful policy levers to reduce obesity do not fall within their control. “Unfortunately the effectiveness of jurisdictional level actions to prevent obesity is likely to be diminished without concomitant, complementary action taken at Commonwealth level (as has occurred, for example, in tobacco control),” the WA submission states. 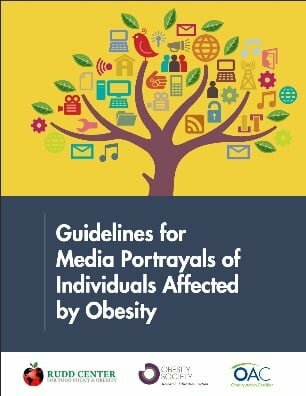 Several submissions stress the importance of ensuring public communications and policy do not have unintended consequences, including exacerbating stigma around weight and adding to body image concerns and eating disorders. Over recent years at EDV we have had increasing numbers of parents and teachers seeking information and support regarding concerns of body shape and size expressed by children as young as 5 years. These children have internalised messages about food and eating that have resulted in body dissatisfaction, purging and restricted eating patterns. For parents, a fear of childhood obesity can mean they move from talking to children about nutritious and balanced diets to talk of weight loss, dieting, and labelling foods “good” and “bad”. Children (and adults) may also be subjected to weight related bullying as a result of a shaming of people who are overweight or obese. While there isn’t a simple answer, public health campaigns should consider the impact of messages on people who might be at risk of developing an eating disorder, or people who already have an eating disorder, in order to minimise the risk of harm to these Australians. Food Fairness Illawarra also stressed the need to “ensure education or campaign approaches demonstrate no unfavourable impact, such as stigmatisation, blaming and misconceptions about the importance of physical activity and good diet as protective factors”. 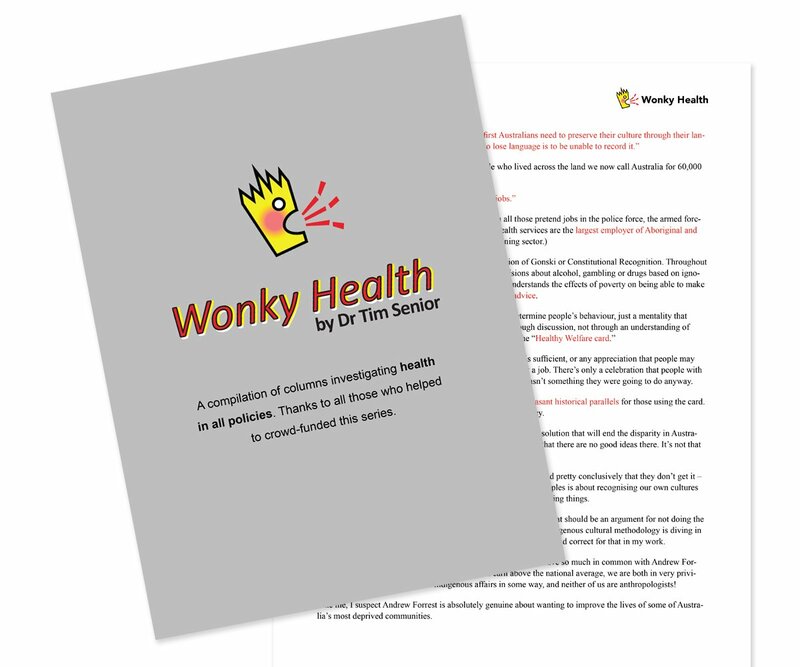 The academics who made Submission 52 said terms such as ‘epidemic’ (as used in the inquiry title), ‘time bomb’ and ‘threat’ to describe obesity are “problematic because they generate a language of panic and fear”. About 15 percent of submissions came from industry (advertising, food, beverages, media etc), with many shared messages. Industry submissions typically stressed how many people their sector employs, their contribution to the economy, the effectiveness of self-regulation, and their long history of responsibility in relation to health and their commitment to working in partnership with governments to address obesity. Other recurring industry refrains include the importance of personal and lifestyle choices, and parental responsibility. Other industry submissions cane from Fonterra Australia, Nestle Australia, Australian Sugar Alliance, Grains and Legumes Nutrition Council, Dairy Australia, Free TV Australia, Coca Cola Australia, Coca Cola Amatil, Haigh’s Chocolate, the Australian Food and Grocvery Council, the Australian Association of Convenience Stores and Australian Industry Group Confectionary Sector. Meanwhile, the Australian Chronic Disease Prevention Alliance and a number of other submissions gave many examples of the marketing of unhealthy foods to children and its detrimental impacts. Australian children are exposed to vast amounts of unhealthy food marketing across a range of media platforms, including television, digital media (websites, social media, email, text messages, apps, branded games), print, radio, cinema, outdoor media, direct marketing, product packaging, sports sponsorship, point of sale promotions, and embedded marketing. Food companies spend large amounts on food and drink advertising, with an estimated $402 million spent on food advertising in Australia in 2009 and a further $149 million spent on non-alcoholic drink advertising. Further, the Alliance said industry self-regulatory codes have significant limitations (including loopholes), compliance is not monitored and there are no meaningful sanctions for breaches. The Grattan Institute (submission 50), the Charles Perkins Centre’s Food Governance Node (submission 58), and the NHMRC Centre of Research Excellence in the Early Prevention of Obesity in Childhood (submission 10) unpick many of the claims made in industry submissions. Meanwhile, the Institute for Physical Activity and Nutrition at Deakin University cited a study conducted in 2015 investigating new foods introduced into the Australian market. The majority of the 4,143 new products launched were classified in the least healthy categories, while fruits and vegetables represented just three percent of new products. Interestingly, a greater proportion of new products launched by companies that publicly committed to improve the nutritional quality of their products were unhealthy, and a lower proportion were healthy, compared with new products launched by companies that did not so commit. Some submissions critiqued the Australian Beverages Council’s recent proposal for Australian soft-drink businesses to voluntarily lower the average sugar content in their beverages by 20 percent. This move is too slow and too little, delivering a tokenistic gesture from industry taking nominal action to evade strengthening calls for mandatory regulation. The Centre for Adolescent Health in Melbourne said the Council’s proposal was overly “soft”, and instead stressed its support for a tax on sugar-sweetened drinks, which it said had already been introduced by 30 other countries. The table below is from the Grattan Institute’s submission. A submission from the National Centre for Epidemiology and Population at the Australian National University cited a 2008 analysis of submissions to a health inquiry showing that framing of policy debate around obesity primarily focused on personal responsibility, with little attention to macro social and economic factors that contribute to inequality. The analysis also found that the advertising and other industries tended to frame obesity causes and solutions in ways that were “explicitly self-interested”. 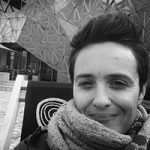 These findings, which remain relevant today, raise questions about the way in which industry-led submissions are given equal weight with independently funded, university-based research. 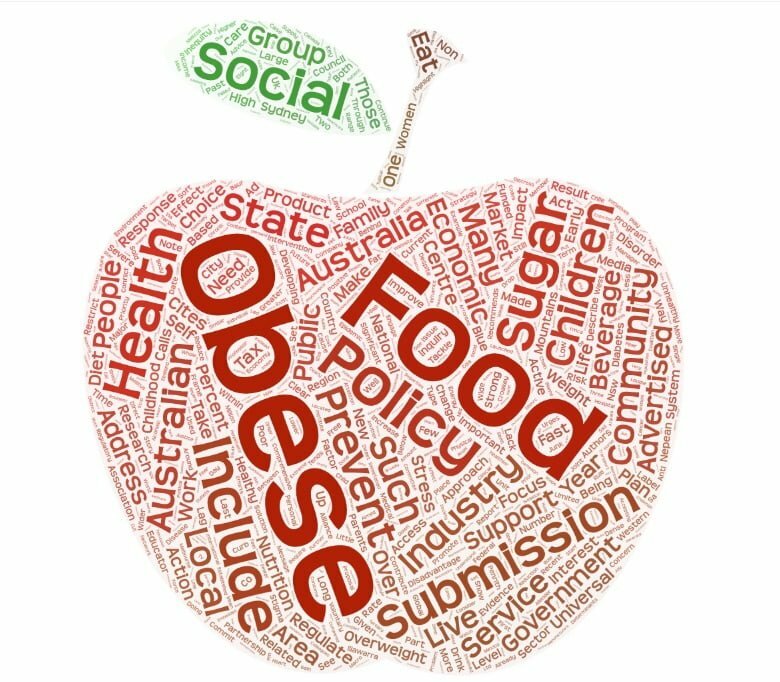 The researchers who contributed submission 52 state that food industry involvement in Australian health policy development has posed a substantial barrier to effective obesity prevention. 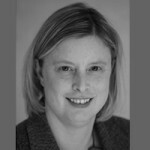 “Food industry representatives have been embedded in obesity taskforces and policy strategy development over the past two decades despite clear conflicts of interest, with the consequence of perpetuating a focus on individual choices and keeping regulatory policies off the agenda,” they said. Many see the similarities between tobacco and food industry interests and strategies, with industry representatives actively working to influence public and policy debates with a view to minimising the potential for regulation. From Croakey’s perspective, it seems sensible to also require submitters to such inquiries to explicitly declare conflicts of interest. It is not clear from many submissions whether the authors had any ties to industry, including through accepting research grants or other funding. This article began with the submission by the Nepean Blue Mountains Family Obesity Service for a few reasons: the authors spoke from real, lived experience about the wider contributors to obesity and about the impact upon the current and future lives of young children. (And I also liked how the submission was inclusive, in recognising the contributions of a wide range of staff from the service). The authors’ passion and concern for social justice leapt off the page. They can see how structural inequity is affecting the lives of the people they care for, and they weren’t afraid to express their concern about how governments and systems are letting down those children and families who are most in need of support. But they also framed obesity as an issue for the local economy. Other submissions also suggested that overweight and obesity are both cause and effect of social and economic inequality. After spending the past few days reading the submissions (admittedly at speed), my take away reflections include the importance of locating efforts to tackle obesity broadly, as part of wider efforts to tackle social and economic inequality and health inequities, and that place-based efforts to empower local communities are an important component of this. As we gear up for another federal election, it’s also a reminder that any political party without a comprehensive health-in-all policies plan for tackling social and economic inequality – one that addresses issues such as over-incarceration, the dominance of anti-health corporates, the inadequacy of #Newstart and other social support systems, racism and other forms of exclusion – does not actually have a health policy. Thank you- another excellent article synthesising submissions that most, like me, will probably not be able to read!